(Photo by Darren Andrew Weimert) Maggie and Derec Markle with their children (from left) Kada, Tiaden, Macy, Ellie, and Eva. That’s the saying on the ceramic plaque that hangs on the burned-out front door of the Gatesburg home of Derec and Maggie Markle. 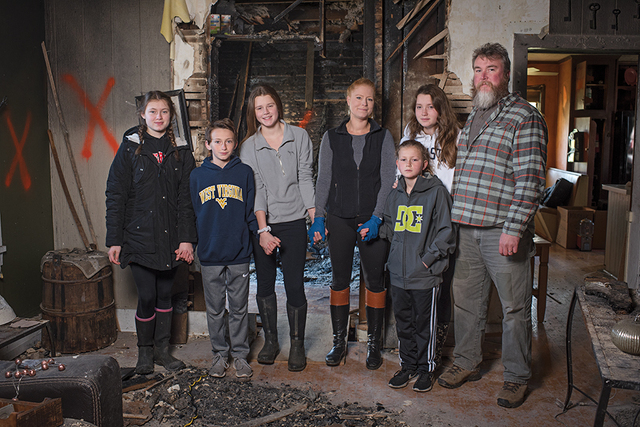 It serves as a reminder to the Markles and their five children that they have much to be grateful for as they start to pick up the pieces following a devastating house fire. Even as the couple recounts the awful event and its aftermath, their focus is on the positive: the kindness of friends, neighbors, and strangers alike; the love of family; the professionalism of the companies who are helping them to rebuild; and the many ways things could have been worse. Junior high sweethearts who started dating as students at Park Forest Middle School, the Markles were returning on October 15 from a trip to Colorado, where they celebrated their 16th wedding anniversary. Anxious to get back home to their children – Kada, 14; twins Eva and Macy, 12; Tiaden, 11; and Ellie, 8 – they turned on their cell phones when their plane landed at their connection in Chicago, only to discover a plethora of frantic texts and phone messages imploring them to call home right away. They soon learned that their home, an old farmhouse on West Gatesburg Road, had caught fire while the kids had been at school that day. Fire investigators later determined that the fire was most likely caused by a lithium ion battery in a headlamp stored on a utility closet shelf in the mudroom. Once assured that their children, who had been in Derec’s father’s care during their absence, were safe, the shell-shocked couple faced an anxious wait in the Chicago airport for their delayed flight to State College. Strangers continued to offer kind gestures, giving up portals at the airport charging stations for Maggie and Derec to charge their phones, and changing seats so the couple could sit together on their flight home. When they finally arrived home that night, they learned the details of the day’s unfortunate events. Eventually, firefighters from Alpha Fire Company, Port Matilda, and Warriors Mark arrived and extinguished the fire. Two rooms were completely gutted and more than 80 percent of the contents of the home were considered a total loss because of soot and smoke damage. Even so, the damage could have been even worse had it not been for the quick actions of the Guenots. Family members took the Markles in overnight while their insurance company worked to find them a suitable rental house. During this time, they were overwhelmed by generous offers from friends and neighbors. The Markles even express gratitude for Erie Insurance and the company’s help in coordinating the rebuilding and recovery effort. Still, it was difficult for the family to come to terms with the hard facts that almost everything they owned was not salvageable. So the Markles were touched by many more acts of generosity: Neighbors and friends who brought them daily essentials like hair brushes and toothpaste and hangers and office supplies. Acquaintances who made meals. Teachers from Ferguson Township Elementary School who collected bins full of games and toys for the children. Clients – Derec is the owner of Yonder Mountain Conservation Company – who offered clothing and donations. Old friends who reached out with thoughtful text messages. Eva’s young friend from cheerleading who baked them cookies. The anonymous donor who tucked an envelope containing $200 into their burned-out front door. “The giving has been phenomenal,” Maggie says. “There’s just so much beauty in this tragedy; so much giving that makes us want to pay it forward." The Markle family is much more accustomed to being on the giving end of kindness. In what he describes as a poetic twist of irony, Derec says the Markle kids participated in Children’s Day at the Central Pennsylvania Festival of the Arts one year, selling bracelets and earring holders. They donated their proceeds – about $500 – to a family in the Lewistown area who had lost their home in a fire. Each November, the family hosts a party they call “Chimi Night,” where they serve chicken chimichangas and request a donation to the State College Food Bank from all of their guests. Chimi Night was put on hold this year, but the Markles are already planning to bring it back next November, when they’re back in their newly rebuilt farmhouse. “We’ll give back in a way that relates. I’m not sure what yet, but doing something for either fire companies or fire victims will be what we ask people to do,” Maggie says. In another ironic twist, the Markles have always been fanatical about fire safety. There were smoke detectors, carbon monoxide detectors, and fire extinguishers in almost every room of the house; they stored a fire ladder under their bed; and they used to hold family fire drills when their children were small. It is clear that their family is a source of strength for the Markles. “We usually say a prayer before we go away, and before we left for our anniversary trip to Colorado – I don’t know what kind of intuition Derec had, but he wanted to do this – we all interlocked our hands and took a picture, and we labeled it, ‘Markle Strong,’” Maggie says. The Markles believe that others can learn from their experience.